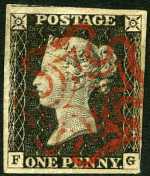 1840 1d Black Queen Victoria imperf from Plate No 2 with 4 mostly wide margins fine used with neat Red Maltese Cross cancellation. Double G letter. Slightest surface rub at lower right. 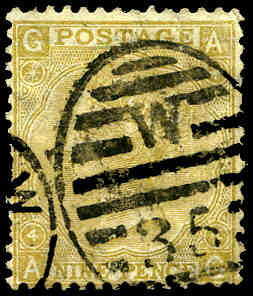 Corner letters F.G. Sg 3. Catalogue Value $735.00++. 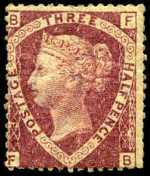 1840 1d Grey Black Queen Victoria imperf from Plate No 2 with 3 wide and one close margins fine used with neat Red Maltese Cross cancellation. 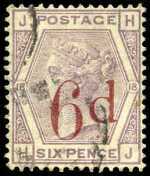 Corner letters H.C. Sg 3. Catalogue Value $735.00. 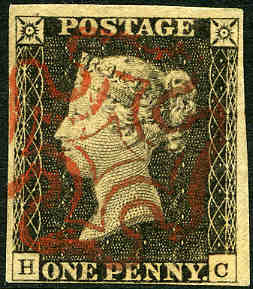 1840 1d Black Queen Victoria imperf from Plate No 4 with 3½ good margins, just touching at upper right fine used with neat Red Maltese Cross cancellation. Corner letters O.G. Sg 2. Catalogue Value $578.00. 1840 1d Black Queen Victoria imperf from Plate No 4 with 3 margins fine used with Black Maltese Cross cancellation. Corner letters D.L. Sg 2. Catalogue Value $631.00. 1840 1d Black Queen Victoria imperf from Plate No 5 good used with 4 margins and Red Maltese Cross cancellation. Corner letters P.J. Sg 2. Catalogue Value $578.00. 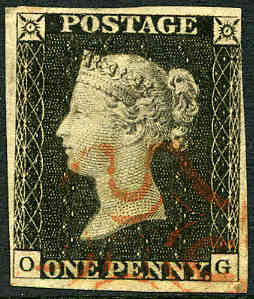 1840 1d Black Queen Victoria imperf from Plate No 6 with 4 good margins fine used with variety "Side line on NE square absent. Corner letters D.K. Sg 2. Catalogue Value $578.00. 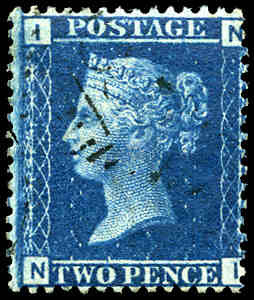 1840 1d Black Queen Victoria imperf from Plate No 6 used with small thin, plus another from Plate No 4 FU with crease and 1841 2d Blue Queen Victoria imperf with white lines added used. All 4 margin copies. Sg 2 and 14. 1840 2d Blue Queen Victoria imperf from Plate No 1 fine used with 4 good margins and Red Maltese Cross cancellation. Corner letters R.C. Sg 4. Superb. Catalogue Value $1,735.00. 1841 1d Red-Brown Queen Victoria imperf with 3½ margins MLH, just touching at lower left. Sg 8. Catalogue Value $893.00. 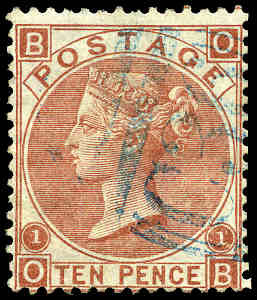 1850 1d Red-Brown Queen Victoria with alphabet type 1 experimental perf 16 by Henry Archer from Plate No 98 FU with a few short perfs. Sg 16b. Catalogue Value $998.00. 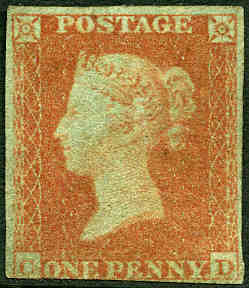 1870 ½d Rose-Red Queen Victoria complete set of Plate No's including scarce Plate No 9 in good to fine used condition. 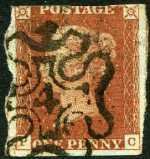 (15 stamps). Sg 48. Catalogue Value $2,595.00. 1847-54 6d (2), 10d and 1/- Queen Victoria embossed issues cut to shape. Catalogue Value $7,040.00. 1865 9d Straw Queen Victoria from Plate No 4 with Emblems Wmk good used. Sg 98. Catalogue Value $1,050.00. 1867 10d Pale Brown Plate 1 Queen Victoria with Spray of Rose Wmk VFU. 2 blunt perfs. Sg 114. Catalogue Value $631.00. 1880-83 6d on 6d Lilac fine used with light cancellation. Sg 162. Catalogue Value $273.00. 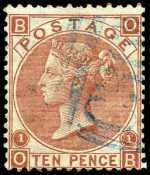 1877 £1 Brown-Lilac Queen Victoria Telegraph stamp with Shamrock Wmk good used with CDS and boxed cancellations. 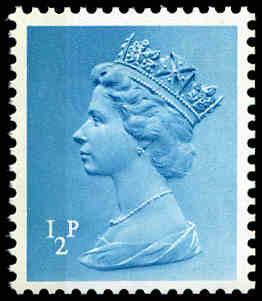 A similar design to the long £1 Brown Postage stamp, so would make a cheap space filler for this stamp in your album. Hiscocks 38. Sg L 236 (2). Catalogue Value $420.00. Collection of 180 used Queen Victoria stamps from 1840 to 1879 including 1840 1d Black imperf FU with small thin and range of 1d Red Plate No's from No 71 to 224. Some faults and heavy cancellations as usual. High catalogue value. 1887-1900 Queen Victoria Jubilee set excluding 1/- Dull Green in fine MLH condition. 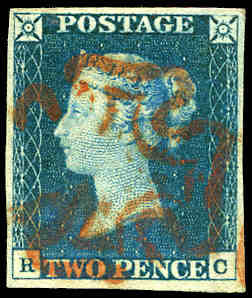 ½d Blue-Green, 10d and 1/- Green and Carmine lightly creased and 1½d, 2d and 4d with tone spots. Sg 197, 198, 200-202, 205, 206, 207a-210, 213 and 214. Catalogue Value $735.00. 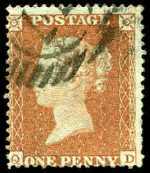 1891 £1 Green Queen Victoria good used with faint crease at upper right and small crayon registration line. Sg 212. Catalogue Value $1,367.00. 1902-13 KEVII Definitive set of 15 to 1/- value mint hinged. 2½d and 3d values with minor faults. Catalogue Value $841.00. 1902 2/6, 5/-, 10/- and £1 KEVI good used with faint toning. £1 with few short perfs and faint crease. Sg 260, 263, 265 and 266. Catalogue Value $3,030.00. 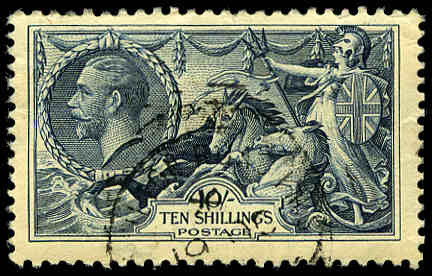 1902 £1 Blue Green KEVII fine used with small closed tear and light crease. Attractive space filler. Sg 266. Catalogue Value $1,367.00. 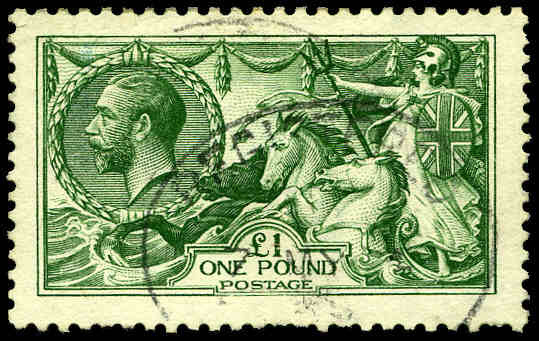 1913 £1 Green Seahorse fine used and well centered with a few short perfs at base. Sg 403. Catalogue Value $2,630.00. 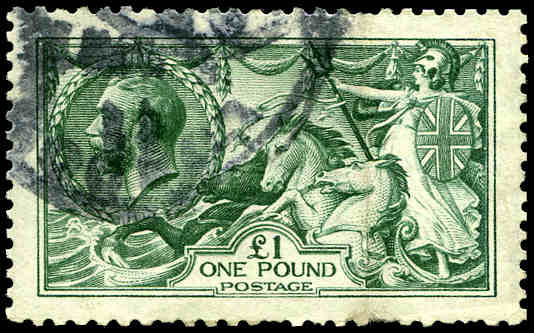 1913 £1 Green Seahorse good used and well centered with a few short perfs. Sg 403. Catalogue Value $2,630.00. 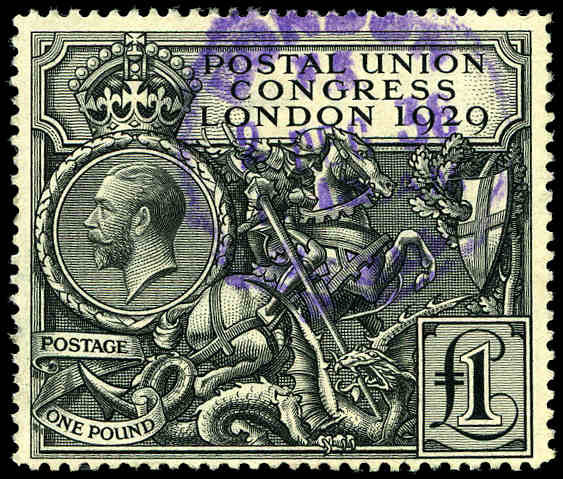 1929 £1 PUC fine used with Violet CDS cancellation. Sg 438. Catalogue Value $1,155.00. 1934 10/- Indigo Waterlow Print Seahorse very fine used with original gum. Bent top right corner perf hardly detracts, otherwise premium quality. Sg 452. Catalogue Value $169.00+. Comprehensive MUH collection from 1937-47 KGVI set of 15 to 1983 Engineering Achievements set neatly presented in two Stanley Gibbons The Plymouth albums with slipcases. Includes 1948 Royal Wedding set, 1951 Festivals set (MLH), 1958-59 Graphite-lined Wildings set, 1959 Phosphor-Graphite Wildings set and complete commemorative issues from 1960 General Letter Office set onwards (No phosphor sets), plus small range of Decimal varieties including 1974 3½d UPU with grossly misplaced horizontal perfs and 1980 12p Women Novelist with missing "P". Few earlier issues MLH. High retail value. 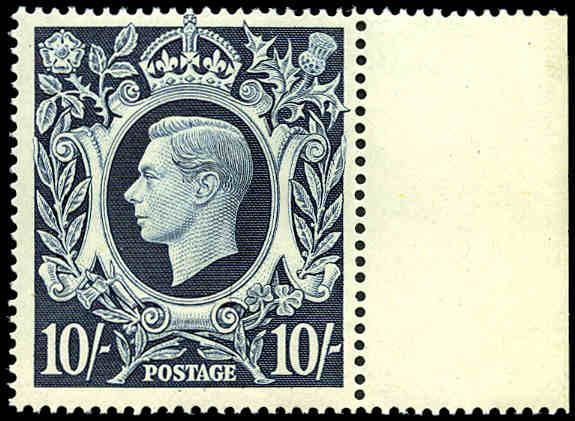 1939 10/- Dark Blue KGVI MUH and reasonably well centered. Sg 478. Retail $406.00. 1948 Royal Wedding set MUH. (2 sets). Sg 493-494. Accumulation of over 200 used higher value commemoratives from 1935 to 1965 including many top values and duplicates. Good range with many good to fine used. Odd fault. Catalogue Value $1,050.00. Collection of good to fine used KGVI and QEII stamps from 1937 1½d Coronation to 1980 Railway strip of 5 including handy items and numerous sets in loose leaf album. Noted 1939-48 High Value KGVI set, 1948 Royal Wedding set, 1951 Festival set, 1955-58 Waterlow and De La Rue print Castles sets and 1959 1½d Green and 2½d Carmine-Red Graphite-lined Multiple Crown Wmk Wildings with inverted watermark. Odd minor fault, but generaly fine condition. Selection of 26 Presentation packs from 1964 to 1975 including 1964 Shakespeare, 1964 Geographical Congress, 1964 Botanical Gardens, 1971 Collectors Pack and 1973 Collectors Pack. Some duplication. Retail $718.00. Catalogue Value $1,332.00. Selection of 123 illustrated booklets from 1955 to 1991 including some Guernsey, Isle of Man and Jersey issues. Catalogue Value $1,462.00. Accumulation of hundreds of Decimal Machin Head issues MUH from 1971 to 2002 including regional issues, phosphor and gum variations. Numerous duplicates. Mainly 1970's to early 1990's period. Face Value $332.00. 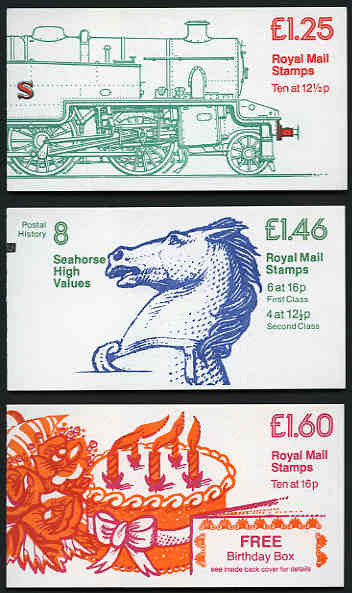 Selection of 31 booklets and 18 booklet panes MUH, plus 8 mainly official Machin Head FDC's from 1972 to 2005. Noted 1972 Wedgewood Booklet Pane on FDC including ½d sideband with minor blemish. Sg X841p. High retail value. 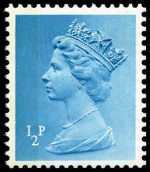 1972 ½p Blue Machin sideband at left MUH and well centered with full perfs. Sg X842. 1972 £1 Wedgewood booklet containing scarce ½p Blue Machin Head with 1 side band MUH. SG DX1. Catalogue Value $157.00. Selection of 47 different booklets from 1974 to 1980 MUH. Catalogue Value $607.00. Collection of MUH Decimal commemorative issues and presentation packs from 1975 to 1993. Face Value $353.00. Largely complete MUH Commemorative collection from 1977 Racket Sports set to 2003 21st Birthday of Prince William set. Some faint toning and duplicates. Face Value $782.00. 1980 Wedgewood (3), 1982 Stanley Gibbons (3), 1983 Royal Mint, 1984 Christian Heritage, 1985 The Times (2), 1989 The Scots Connection, 1992 "Cymru-Wales" 1993 Beatrix Potter, 1995 National Trust (2), 1996 European Football Championships, BBC Anniversary, 1998 The Wildings, 1998 Breaking Barriers, 1999 Profile of Print, 1999 World Changers, 1999 Special by Design, 2000 Queen Mother's 100th Birthday, 2000 A Treasury of Trees, 2001 Submarines and 2002 Across the Universe Prestige booklets MUH. Retail $554.00. Catalogue Value $1,276.00. 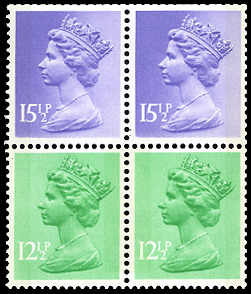 1982 12½p Light Emerald with Phosphor printed both sides and 15½p Pale Violet with one side band at left and one side band at right Machin Head block of 4 MUH. 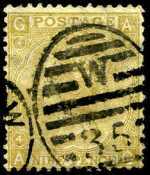 From booklet panes with transposed bands where the phosphor was vertically displaced by one stamp row. 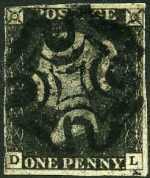 15½p with trimmed top perfs. Normal pane for comparison. SG U214a and U237c and d. Catalogue Value $463.00. Complete collection of MLH stamps from 1986 Commonwealth Games set to 1995 National Trust set including few duplicates. Face Value $398.00. 1988 Australian Bicentenary set in MUH sheets of 100. Face Value $109.00. Also New Zealand 1988 40¢ Australian Bicentenary sheet of 50 MUH. Face Value $20.00. 1989 (3), 1990 Smiles (8), 1991 Good Luck (6), 1991 Pillar Box (6), 1992 Memories (6), 1993 Rupert Bear (2), 1994 Rupert Bear, 1995 Clown (2), 1996 More Love and 1997 Flowers (2) Greetings booklets MUH. Catalogue Value $1,507.00. 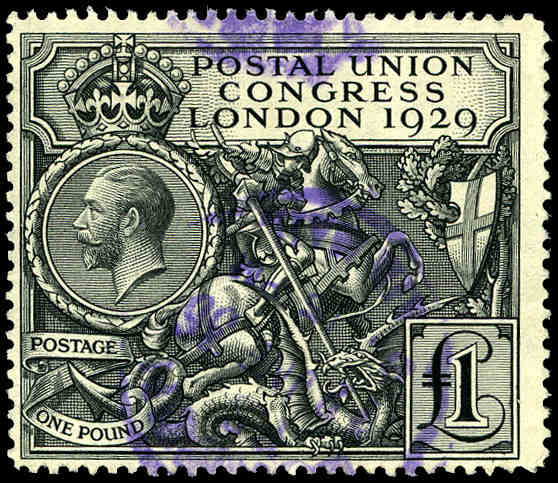 Selection of 259 mainly used Postage Due issues from 1914 to 1975 with various watermarks and values to £1. Some heavy duplication and condition varies. 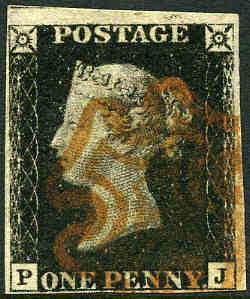 Also 1848 10d Brown Embossed Queen Victoria cut to shape FU with faults. Accumulation of over 800 used higher value Castles and Machin Head definitive issues from 1988 to 1999 including values from 75p to £10. Mainly good to fine used with some faults. Selection of MUH stamps from 1984 to 1991 including some duplication. Face Value $235.00. Collection of MUH Decimal commemorative issues from 1984 to 1993 including up to 3 sets of most issues. Face Value £175.00. ($367.00). Accumulation of MUH Decimal commemorative issues from 1971 to 2006 including numerous sets. Face Value $1,052.00. Accumulation of used higher value commemoratives on piece from 1995 to 2004 comprising 60p to 68p (400) and £1.12 (20). Average used with some heavier cancels and faults. Selection of 42 mint and used Queen Victoria and KGV issues including highly catalogued items, varieties and some duplication. 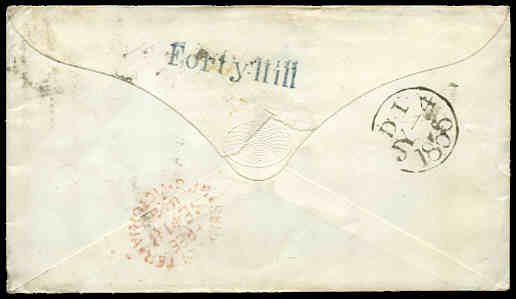 Noted 1841 2d Blue Queen Victoria imperf with lines used (2), 1912 ½d Green Die B Simple Royal Cypher Wmk KGV with Inverted Wmk used and 1912 ½d Green and 1d Scarlet (2) Imperial Crown Wmk KGV with No cross on crown variety used. 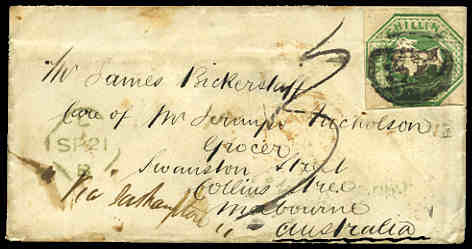 Also U.S.A. 1863 5¢ Fractional Currency label. Condition varies. Catalogue Value over $1,514.00. 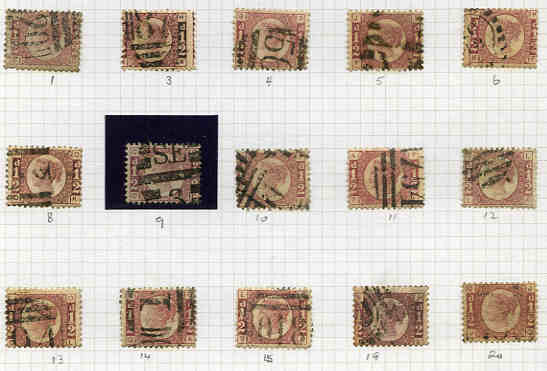 Collection of many hundreds of MLH and used stamps from 1840 to 1976, on leaves with the strength in the earlier period. 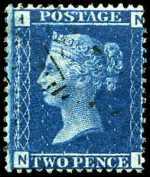 Commences with 1840 1d Black (4) and 1840 2d Blue Queen Victoria without lines (2) and thereafter largely complete with many issues represented with complete or near complete Plate Numbers. 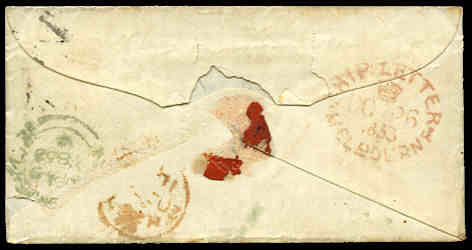 Many later issues represented both MLH and and FU with a good range of watermark, shade, phosphor and graphite variations. 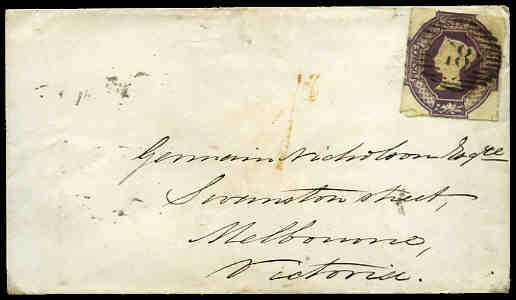 Usual odd fault and typical heavier cancellations, but generally better than average condition on most Victorian issues. Some modest duplication, but mostly different. Ideal basis for an advanced collection or useful reseller lot. Well worth inspecting, too wide ranging to describe concisely. Catalogue Value $98,825.00. 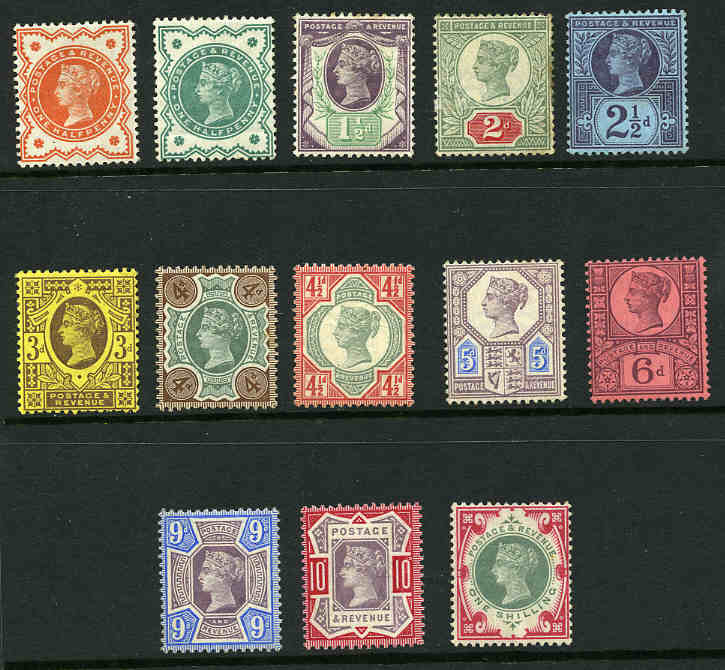 Collection of MLH and used stamps with some earlier issues and a good representation from KEVII period to 1980, often both mint and used in large loose leaf album. 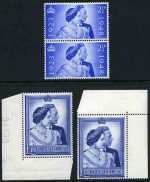 Noted 1948 Royal Wedding set MLH and FU and 1959 Phosphor Graphite Wildings set MLH. High catalogue value. 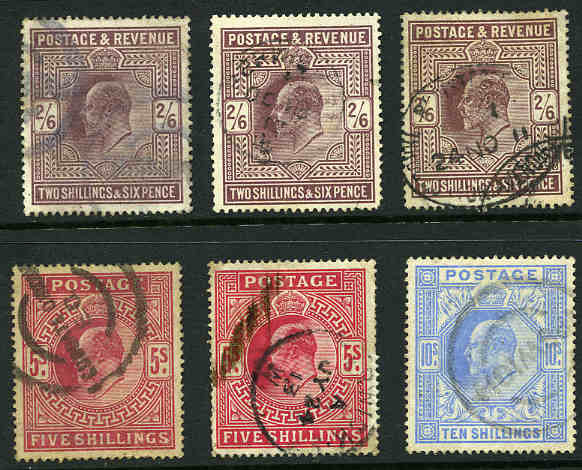 Collection of 465 used Queen Victoria, KEVII and KGV stamps from 1840 to 1935 including range of highly catalogued items. 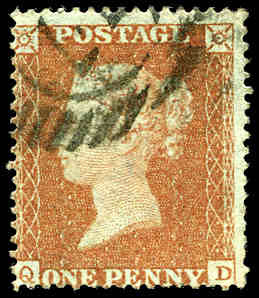 Noted 1840 2d Blue Queen Victoria imperf with smudged Red Maltese Cross cancellation. 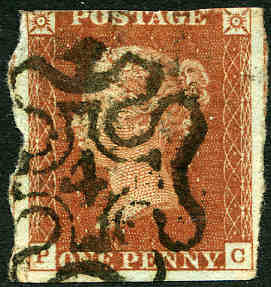 Some duplication and varying condition. Collection of many hundreds of mostly used stamps from 1840 to modern in 2 volume Hagner Album including a good range of early issues, some modest duplication and many highly catalogued items. Condition varies as normally expected. Catalogue Value $27,000.00. 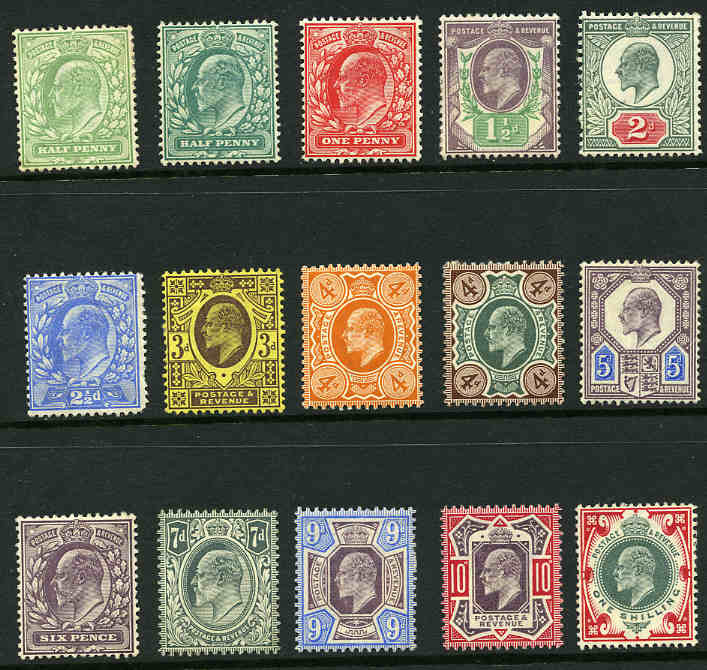 Collection of many hundreds of MUH, MLH and good to fine used stamps from a range of periods in 2 Hagner albums. Accumulation of many hundreds of used QEII period higher value commemoratives to £1.12 and definitives to £10 in small box. Mainly good to fine used with considerable duplication and some faults. Very high catalogue value. 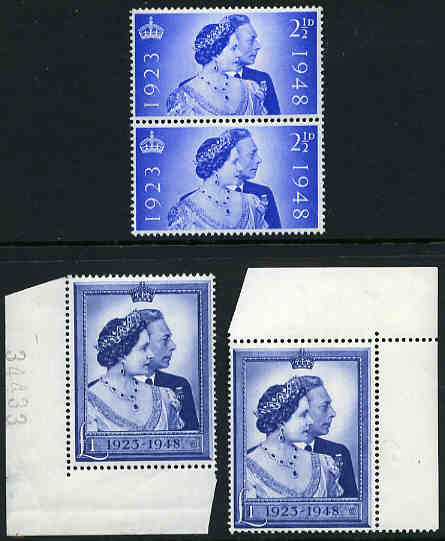 Accumulation of 5,000 used QEII Commemorative or high value Definitive issues off paper in shoebox. Accumulation of mint Pre-Decimal and Decimal stamps including some booklet panes and many MUH in small stockbook. Some duplication. 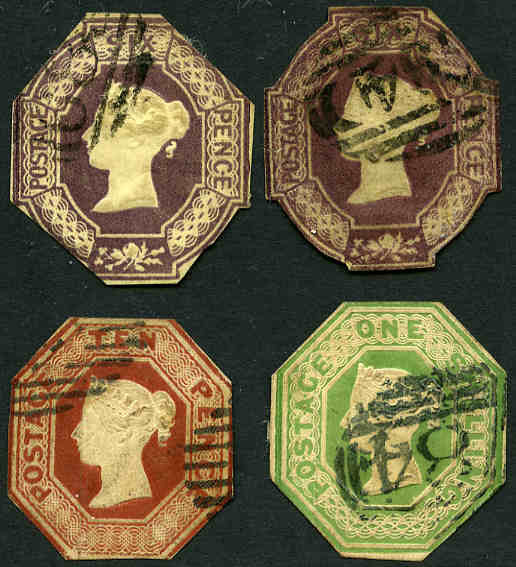 Collection of mostly used stamps with a highly catalogued selection of earlier issues on leaves including 1840 1d Black Queen Victoria imperfs (2) and numerous other useful items. Some faults and heavy cancellations. Catalogue Value $14,775.00. 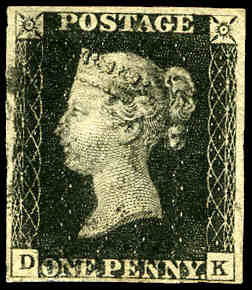 Accumulation of many thousands of used stamps from early to modern, some sorted into packets including some bulk Queen Victoria and numerous higher catalogued items in shoebox. Varied condition. Accumulation of thousands of used QEII period stamps from early to modern off paper in shoebox. Numerous Commemoratives. Accumulation of many hundreds of mostly used stamps in 5 albums or stockbooks including a highly catalogued range of Queen Victorian issues and numerous higher values. 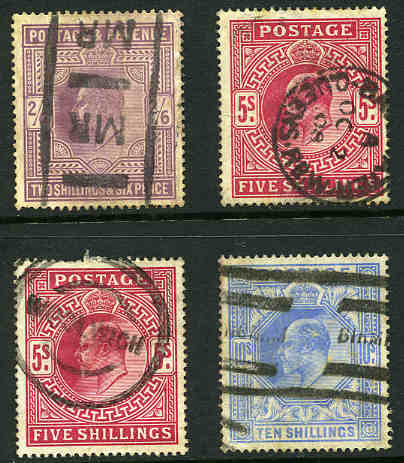 Numerous duplicates with condition varying from poor to fine. Very high catalogue value. Complete MLH collection from 1973-75 Definitive set to 1980 Europa set including Postage Due issues, some duplicates and fine used sets, plus range of mint and used Channel Island and Regional issues on album pages. All issues from 1975 onwards MUH. Largely complete collection of presentation packs from 1970-74 Definitive set to 1995 Camellias set. Odd duplicate. Face Value $302.00. Largely complete collection from 1970-74 Definitive set to 1995 Camellias set CTO with gum. Odd duplicate and few early sets without gum. Face Value $298.00. Largely complete collection of 48 booklets from 1974 to 1995. Odd duplicate. Face Value $210.00.